Enemies turned comrades, in less than a decade? Cody and Sitting Bull only worked together for a few months in 1885, but it's a fascinating chapter in the lightning-fast transition from Wild West reality to traveling circus. In her compelling Blood Brothers, Deanne Stillman, an expert on the American West, examines their lives to explore the era’s complexities … Stillman also shows that a third person was crucial to the relationship between the two men: Annie Oakley. Both were a bit in love with that remarkable woman, and her story is as riveting as theirs. Stillman’s writing can be beautiful and evocative, but there are some head-scratchers, too...She is also prone to dizzyingly long sentences, some of which clock in at 100 words. Finally, with most of the conversations between the protagonists lost to time, along with their thoughts, Stillman too often compensates with speculation, couching her points with ‘perhaps,’ ‘maybe,’ ‘may have said,’ ‘may have replied,’ and the like … While the book’s subtitle promises ‘the story of the strange friendship,’ we end up understanding less about the friendship — its meaning to the two men — than about its strangeness, tinged with tragedy. 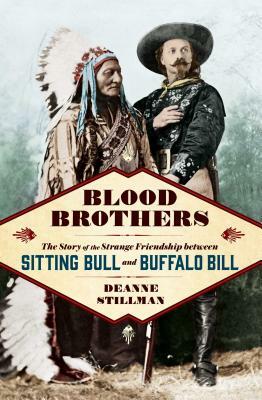 What did you think of Blood Brothers: The Story of the Strange Friendship between Sitting Bull and Buffalo Bill?